Have you seen those films where you walked out wondering if it was a waste of time or not? Sometimes you hate a film and sometimes you love it. But in that gray area somewhere in the middle you wonder if it made any impact at all. In Time, written and directed by Andrew Niccol (Gattaca, Lord of War), offers an intriguing concept. What if your lifetime became currency? Sure, you stop aging at age 25, but you only get one more year to live and you have to use that time to pay for goods and services. You can work to earn more time, but the cost of living continues to rise. Not only would this solve the overpopulation crisis, but it offers potential immortality for those who can afford it. Along the way we meet Timekeeper Raymond Leon (Cillian Murphy, Inception, The Dark Knight, Sunshine) who’s job it is to apprehend Will for having too much time on his hands, Borel (Johnny Galecki, TV’s Big Bang Theory) who is Will’s best friend and an alcoholic with a new family, Sylvia Weis (Amanda Seyfried, Red Riding Hood, Letters to Juliet, TV’s Big Love) who is a spoiled rich girl looking for a way to get more out of life, and Philippe Weis (Vincent Kartheiser, TV’s Mad Men and Angel) who is Sylvia’s father and a big time banker. Each of these offers a different perspective on the whole “time as currency” idea, from maintaining a world order based on the rich wanting to live forever and the poor paying for it to just trying to live in the moment. It’s not a bad film and has some fun special effects scattered throughout, such as the car crash where Timberlake and Seyfried roll a car traveling at speed into a concrete culvert with hardly a scratch. It’s also quite stylized, with a stark contrast between the poor sections of civilization and the rich. I’m still not convinced that either Timberlake or Seyfried can act. And the fact that everybody in the film, rich or poor, happened to be attractive and young really made the whole age aspect of the movie seem very one-dimensional to me. It’s just not something I would consider seeing again, but if you’re interested in seeing most of the hot young actors and actresses in a movie, In Time should be in your queue to rent. Feature-wise, this was a very light DVD. It includes the theatrical trailer, a collection of deleted/extended scenes, and a bunch of trailers for other FOX projects. None of the deleted scenes really added much to the viewing experience, so I was glad they weren’t added to the nearly two hour running time for the film. Though I’ve reviewed a few books that didn’t pan out like I hoped, one of the things I enjoy about writing reviews is getting a chance to read things I might not have picked up for myself initially. I tend to wear blinders sometimes, focusing on those writers and genres I would normally pick up or consider picking up for myself. In the second half of 2011, my friends at Tor Books threw me a curve ball that I wasn’t sure I’d enjoy. Turns out I actually did! Quite honestly I wasn’t sure what to expect from this book. Like many adventures, it begins with the three main characters starting out their journeys and ends in an explosive way when those three paths meet. And yet the way world elements are introduced, through flashbacks of the main characters, exposition in characters we meet along the way, and then through children’s books read along the way and snippets of conversation, it all seems so natural and organic that it gently tugs you along towards the conclusion. The larger organizations of the Line and the Gun were quite intriguing to me and I only caught glimpses of their philosophies as the story progressed. The Line was easiest to figure out as the embodiment of progress. In this case, it was the railroad line and the Engines that drove things forward. The Gun was a bit more difficult. I believe the Gun falls on the side of rugged individualism and the Western spirit. Beyond that, each side had an intriguing “spiritual” aspect that spoke to its agents in various ways. The Line almost seemed a bit like George Orwell‘s dystopian 1984, with the individual suppressed in favor of the larger machine. And the Gun, though I’m not a big fan of Westerns, hit me something like the lone gunman approach of many Spaghetti Westerns of the 1960s. The characters’ relationships with these disembodied leaders also varies a bit. A Linesman doesn’t dare question orders, just plowing forward at any cost. And Agents of the Gun seem to have a back and forth conversation with the “demons” inhabiting their namesake weapons. It was almost like the “devil on your shoulder” approach talking you into doing things you don’t believe you should. 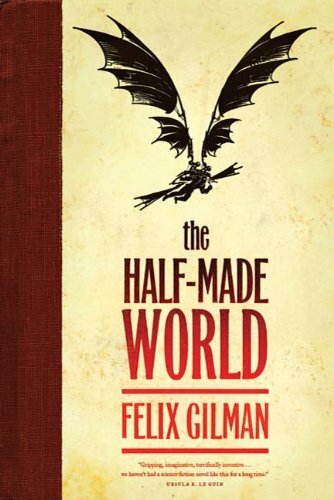 The Half-Made World by Felix Gilman is a tough book to pin to any one genre, but I think it should be enjoyable to anybody who likes their fantasy and science fiction with a bit of a philosophical bent. Now I’m going to have to see what else Gilman has written!